In the 2018/19 budget the City of Armadale committed to improving Migrant Park with the construction of a fantastic new playground. We knew the local families couldn't wait to play so given the advanced completion of the main playground works ready for play, we decided to open early. Unfortunately some outstanding works not critical to the kids enjoyment are still to be done including a Synergy power connection for the BBQ and shelter lights due in one to two weeks, as well as some decorative laser cut steel panels on the shelter walls. 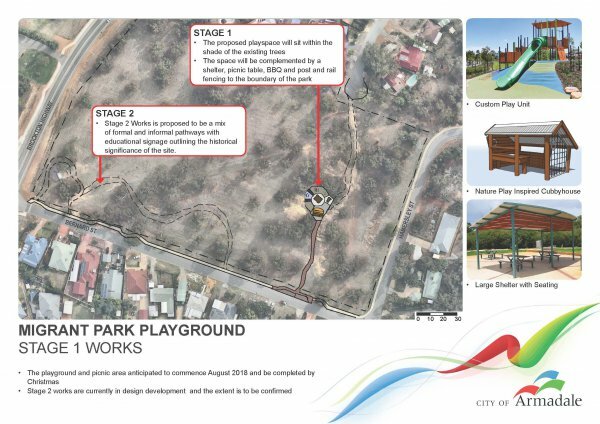 Stage 1 works included construction of new elevated playground with a customised shelter that reflects the historical relevance of Migrant Park “Nissan Huts”. New customised shelter, BBQ and seating. New pathways linking the pathways to new street side parking. Nature play cubby house, embankment slide, sand wheel, nature play elements and musical play elements. Stage 2 anticipated completion - June 2019.